Command Sergeant Major (CSM) Thomas began his enlisted Army career in 1992 at Basic Training at Fort Sill, OK and Advanced Individual Training for 91F Psychiatric Technician (now 68X Mental Health NCO) at Fort Sam Houston, TX. His first duty assignment was at Fort Hood, TX with the 85th Medical Detachment (Combat Stress Control). During his assignment, CSM Thomas was instrumental in teaching weekly classes to students on stress management, anger management, interpersonal communication, and conflict resolution. He deployed with the 85th to Guantanamo Bay, Cuba for Operation Sea Signal in 1994 and to Bosnia in support of IFOR/SFOR in 1996. He also trained as a 13B Cannon Crewmember during that time. After completing his enlistment with the 85th Med Det (CSC) in 1998, CSM Thomas volunteered for recruiting duty and accepted an assignment with the Cleveland Recruiting Battalion with duty at the Boardman, OH recruiting station. In addition to his recruiting duties, CSM Thomas also spent countless additional hours training his new enlistees in the Delayed Training Program to prepare them for Basic Training. These classes included drill and ceremony, military time, phonetic alphabet, rank structure, land navigation, and physical fitness. As a result, three of his Soldiers earned honor graduate in Basic Training. CSM Thomas also mentored a new Army Reserve recruiter who later became the top new recruiter in the recruiting battalion. After 3 years as a successful Army Reserve recruiter, CSM Thomas left recruiting in 2002 and his next assignment started a long career with the Army Reserve Careers Division as a Career Counselor, and ultimately ended with the high-profile position of Accessions Career Counselor. On battle assembly weekends CSM Thomas continued to mentor and teach pre-basic Soldiers drill and ceremony and other skills necessary to pass Basic Training. 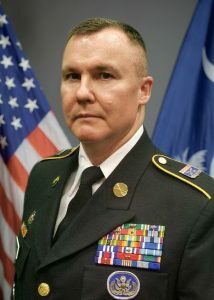 After almost 21 years on active duty, CSM Thomas retired as a Sergeant First Class on 1 December 2013 and subsequently enlisted in the South Carolina State Guard on 11 December 2013 as a Master Sergeant in the recruiting section of 3rd Brigade. He then volunteered to be the First Sergeant of A Company, 3rd Battalion, 3rd Brigade, and is now the Battalion Command Sergeant Major for 3rd Battalion, 1st Civil Support Brigade. CSM Thomas holds four MOS’s: 68X (Mental Health NCO), 13B (Cannon Crewmember), 79R (Recruiter), and 79V (Army Reserve Career Counselor). He is CERT and Master MEMS qualified. His Army awards include the Meritorious Service Medal, Army Commendation Medal (2OLC), Army Achievement Medal (2OLC). He and his wife Yarissa have three sons and reside in Summerville, SC.